Someone likes to make a to-do list with iPhone reminder app, while someone just needs to record few important items with calendar event like birthday reminder, However, deleted calendar entries or lost for other reasons also could happen on you, if this bad thing happens to you, keep calm and continue to read the entire article. 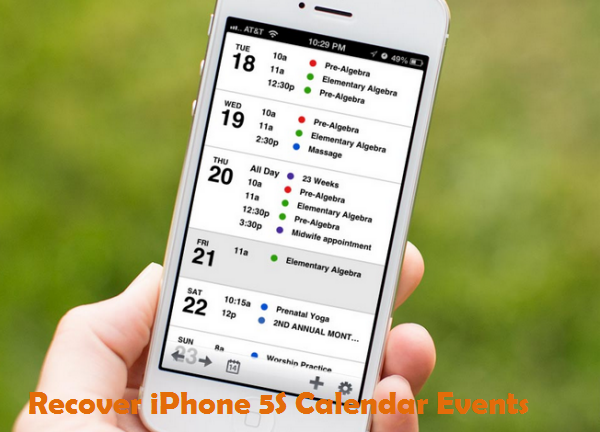 To recover iPhone 5S calendar events, you have 3 choices: iTunes, iCloud and iPhone calendar recovery program. In the following, I will show you how to get back your deleted calendar entries even if you didn’t have backup file. First of all, make sure your lost calendar have been backed up on the iTunes, and do not sync your iPhone 5s with iTunes until get the files back. First, plug your iPhone 5S into your PC via the USB cable. Launch iTunes and click “Summary” tab, then tap “Restore from Backup”. Not only can you recover calendar but other files as contacts, text messages, photos and more. Then the iPhone will restart and run to the Setup Assistant tab, just select “Restore from iCloud” and sign in iCloud account. Neither made a backup on iTunes nor iCloud? Then, iPhone Calendar Recovery program is your only choice! In order to recover iPhone 5S calendar perfectly, we choose the most famous iPhone data recovery program- iFonebox program to show you how to recover iPhone 5S calendar event without backup. Step 2: It will take you few minutes to scan your iPhone 5s, for this scan not just for calendar but for other files. When the scanning is over, click “Calendar” on the left to preview all your lost calendar entries. Step 3: Mark those calendar events you need and hit “Recover” button to save them on your computer. Moreover, the recovery mode of “Recover Data from iTunes Backup” also allows you recover iPhone 5S calendar from iTunes backup.